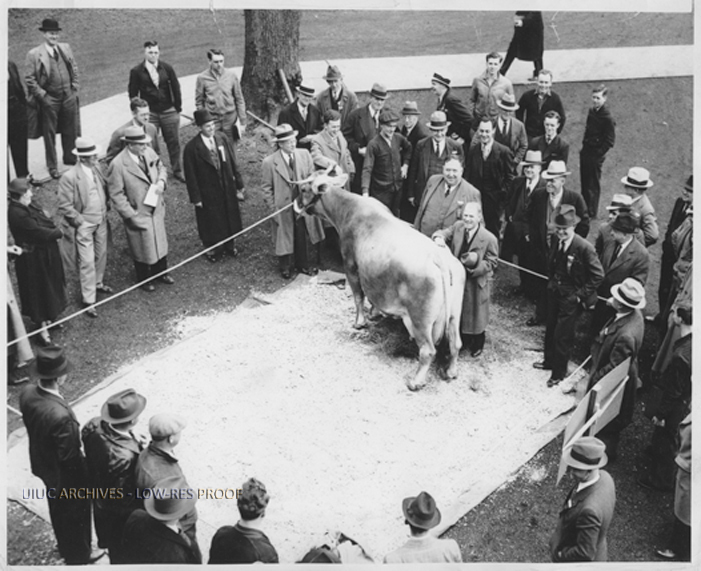 Caption on back reads: "Illini Nellie, world's champion Brown Swiss milk producer, born and developed on college farm, gets the once-over from state legislators, visiting the university [sic] on biennial inspection tour. Illinois agricultural research started when the university [sic] was founded, has been worth millions to the farmers. Example, work of Illinois agricultural researchers pioneered growth and uses for soy bean, an industry now worth $70,000,000 per year to Illinois alone." Illini Nellie (1927-1940) began giving milk in April, 1930. In the ten years of her production, she averaged daily output of 93.5 pints of milk and her total milk production during her lifetime was 194,665.8 pounds.